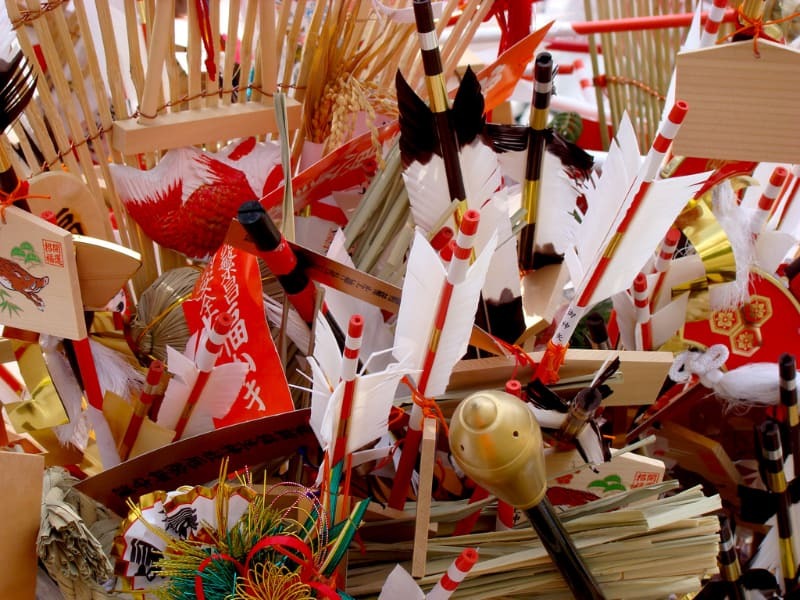 Ever wonder what everyone does with all those New Year arrows, rakes, daruma and that they buy at shrines every year? 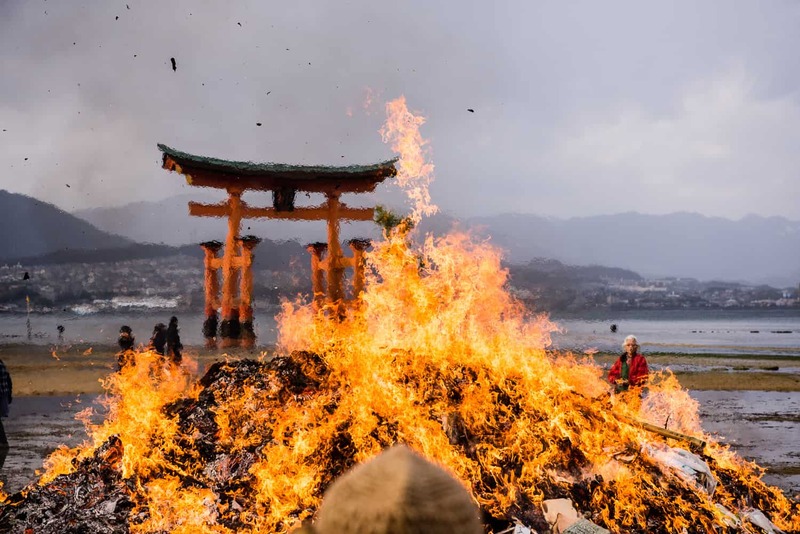 Here in Hiroshima, after a year of luck-giving, they go up in flames on spectacular bonfires around the second weekend of January, at what is known as tondo. If you visited any shrines over the New Year holiday, you probably noticed that people making their way to shrines for their hatsumode visit carrying the previous years decorative talismans and offerings. These are placed in large piles, cardboard boxes or skips within the shrine grounds before praying and buying the new year’s charms and votive goods. 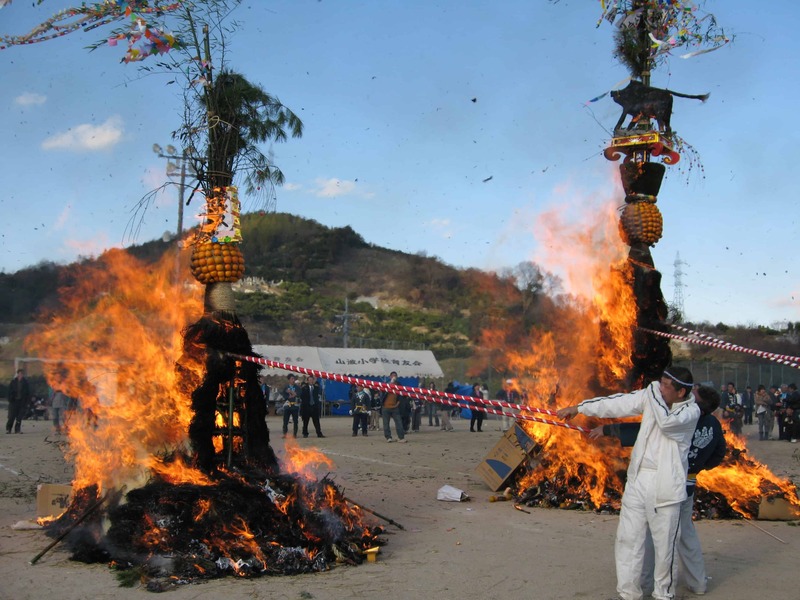 A couple of weeks after new year, at ko-shogatsu – literally “small new year”- which is celebrated at the lunar new year, they are blessed and burnt on bonfires that range from just over head-height to giant towers as high as a house. 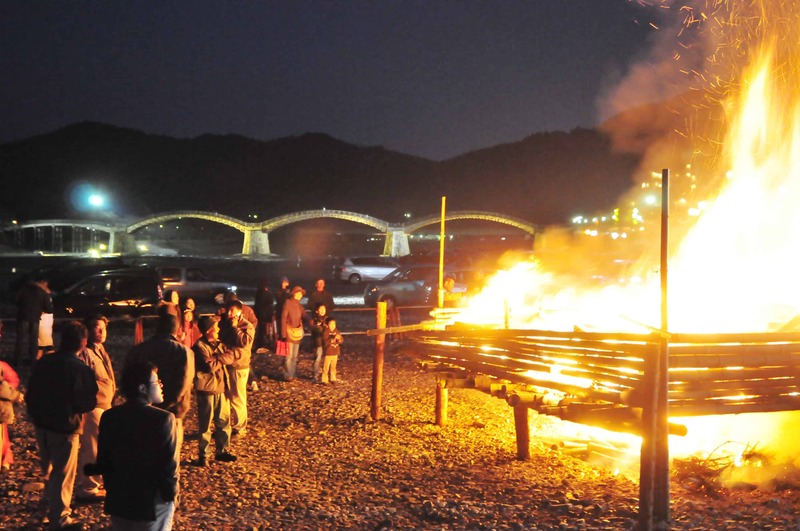 Tondo matsuri are held in the grounds of many of the larger shrines and in public spaces, such as school grounds and along Hiroshima’s wide river banks where the local community gather and roast mochi rice cakes and warm sake over the flames. Tondo is usually held on the 2nd or 3rd weekend of January, generally on the weekend closest to January 15. As mentioned above, the fires can be quite large and it is really quite a sight when the bamboo constructions packed with wooden and paper votive goods catch alight, and the crackling and popping sounds can be heard from quite far away. Although your clothes may smell of burnt offerings when you leave, remember the smoke is supposed to provide good luck. There are no fees to watch or take part in these events, but a donation to the shrine putting on the event is appreciated. Some festival-goers bring their own mochi to roast, but you are likely to be given some to roast if you go there empty handed. Some shrines pass warm sake round, others offer zenzai sweet bean soup – a real treat with roasted mochi cakes on a cold, winter day. View Larger MapHere are some places where you can catch a tondo matsuri, without turning too many heads. The list is by no means exhaustive, and there are held in many shrines and other places, just follow the smoke! 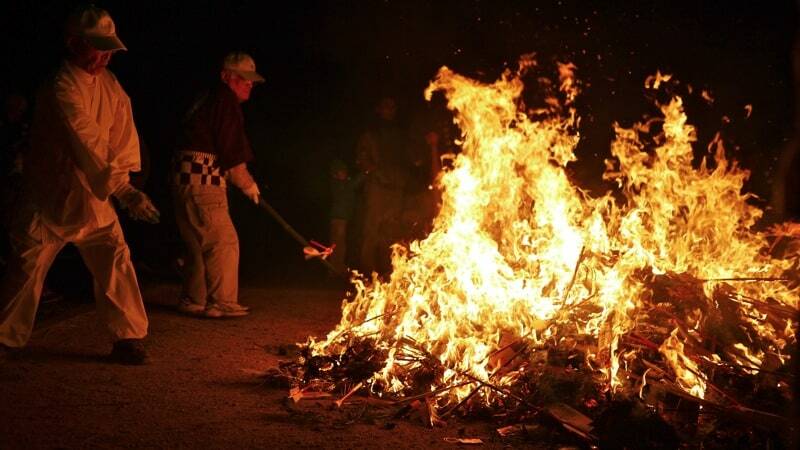 Not far from the Peace Park, across the river from the Family Pool, Sorasaya Shrine’s tondo in the park next to the shrine in Honkawa-cho has huge bonfire and is a family-friendly event where kids can play on the playground as well as watch the spectacle. For such an important shrine, Itsukushima’s tondo is rather low key, held on Mikasa Beach next to the floating torii gate between the tides. Rather than the elaborate bamboo constructions set ablaze in other places, Itsukushima just seems to set light to a pile of cardboard boxes. It is also quite surprising that, this being a UNESCO World Heritage Site, they have now qualms about burning everything, plastic and all. More photos from Itsukushima’s tondo here. Several tondo matsuri are held at the string of shrines, just north of Hiroshima Shinkansen Station. Always a nice walk, it can be fun to do a tour of the fires. This is our local shrine in Ushita. Tondo here is quite a small affair, but pretty lively! This huge tondo is held at Hiroshima Gokoku-jinja Shrine next to the Hiroshima Castle, tondo is always held on January 15, no matter what day of the week that falls on. There is also quite a lively atmosphere as a sizable crowd usually gathers and you are pretty close to popping of bamboo. The guys in charge of keeping the fire under control wear some pretty cool gear here. Sanba Shinmei Tondo Festival which has been held since the 17th century and is designated as a folk cultural asset of Onomichi city. The festival is held on the grounds of Sanba Elementary School. ← And to all a good night!